Correction 1: The original claim on this post of free water taxi service was incorrect. The author apologizes for the error. Correction 2: Only one ramp will still be closed Monday — the northbound ramp from Highway 99 to Dearborn St — while the seven other ramps will be open. Northbound bus re-routes will continue as they are now, while southbound bus re-routes will shift to 1st Ave S, Dearborn and then S Hwy 99. See the map below. The Highway 99 tollway under downtown opens Monday, and will be free for a few months, at least until summer. However, the downtown off-ramp to Dearborn St will not be open yet. That is expected to take another 1-2 weeks to be ready. The Battery Street Tunnel closes at 10 pm tonight to car traffic. Forever. Then pedestrians and bicyclists will have the final access to that tunnel this weekend. WSDOT is spending $4 million ($) to encourage you to get back in your car and check out the tunnel (starting Monday). Expect a lot more car traffic then, with many car drivers surprised to find that they cannot exit into downtown yet. Consider letting others get stuck in that car gridlock first. If you want a less-gridlocked commute, keep riding your bike or riding transit. Re-routed buses will switch to their long-term re-route paths southbound, but the northbound paths will stay the same at least until the Dearborn off-ramp opens. Routes 21X, 37, 55, 56, 57, 113, 120, 121, 122, 123, 125, and C will continue using the yellow path northbound, but will switch to the blue path southbound Monday. Click here to enlarge. Current reroutes that are southbound will switch to the long-term interim pathway once the tunnel opens around Feb. 4. 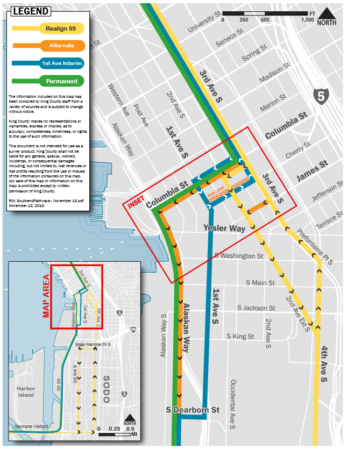 Current northbound reroutes will remain in place until 1-2 weeks after the SR 99 tunnel opens and will then shift to SR 99 and use the Dearborn off-ramp. Travel time is an important factor for switching to SR 99 and Dearborn to First Avenue instead of staying on Fourth Avenue South. The northbound SR 99 bus-only lane begins about 1,000 feet north of the Spokane-to-SR99 loop, and once the Dearborn off-ramp is open, we’ll have a continuous bus lane from that point to Dearborn. Down the road when Alaskan Way is complete, Metro will switch from First to Alaskan Way and a bus-only lane will continue through to Columbia Street. New stops on First Avenue for the long-term interim period are under assessment. Once the waterfront project is completed, buses will stop at Alaskan Way and Jackson and Alaskan Way and Columbia in both directions. The amped-up West Seattle Water Taxi service, which has resulted in a 235% ridership increase year-over-year through January 25, per Switzer, will remain in place until March 27, the last day of the winter sailing schedule. WSDOT is throwing a party this weekend in which the public (with those who obtained time-set tickets getting first entrance priority) can walk, run (on Saturday), or bike (on Sunday) on the viaduct and through the tunnel. The bike ride has long since sold out, even while the City keeps delaying bike infrastructure. Various local streets will be closed to car traffic for Saturday and/or Sunday. Metro bus routes 3, 4, 5, 21, 26, 28, 131, 132, and the E Line will be re-routed just for this weekend to avoid party traffic. The West Seattle Water Taxi will be running this Saturday, and will charge regular fare be free, but with no bus service to the Seacrest dock. Link Light Rail remains the most congestion-free option to get to any downtown party, with nothing but 3-car trains on weekends (so board the third car). Stadium Station gets you closest to the south portal. Metro will be running free shuttles between the south event hub and the north portal. Riders may board the shuttle buses northbound on E. Frontage Rd. S., west of 1st Ave. S. and just south of S. Royal Brougham Way. But if the event is anything like the SR 520 bridge party, expect to wait in a long queue to get on those shuttles. Look for our coverage next week on when the northbound bus re-route re-routes will take effect. In the meantime, do enjoy the party. You may never be able walk through The Tunnel or on The Viaduct again. I can’t speak to whether it will be safe to bike through The Tunnel after Sunday. Joke’s on them, my car’s electric. Looking forward to not bring crushed to death in it on a collapsing viaduct. Do you happen to know where the electricity for recharging your battery comes from? Obviously, not building a car is far better than building a car. But if you’re going to build a car, best to make it electric. Skagit and Pend Oreille rivers, as well as BPA’s dams and WPPSS Plant 1, everything else is a rounding error. The nation’s car fleet definitely needs to move towards electric power…but at the same, you can’t ignore the fixed overhead of manufacture and disposal of a vehicle. Politically, those who switch from gas car to electric car get all the credit, while those who switch from gas car to no car don’t. But, the reality is, if you only need car transportation a couple times a month, it is far greener to do it in a gas-powered Uber car, than to have a separate electric car manufactured just for you, that just sits in the garage 28 out of 30 days each month. (Of course, the Uber cars themselves, are the opposite – because they get driven so much, changing them to electric will have a dis-proportionally large positive impact). How many Uber drivers can afford an electric car? Good point. That’s something that should change, and that a progressive politician could champion. That would be a hard sell nationally or in our own suburbs though. where getting rid of a car makes trips 2-3 times as long and turns even getting to the supermarket into a struggle, so they’d say, “Why should I pay for a credit that large parts of the county can’t benefit from? Still, there should be some recognition of the fact that not replacing a car is more of a contribution to the community as replacing a gas car with an electric car, and they should get something back for it. Otherwise it’s like the situation where homeowners get a mortgage-inerest deduction but renters get nothing, and employer-sponsored medical insurance is pre-tax but individual plans aren’t, and people at large companies or universities get free ORCA cards but other workers don’t. Almost none today. But, when the prices of electric cars go down, that could change. In any case, the more hours per day a car gets driven, the more it’s worth paying extra on the purchase price to reduce the per-mile cost of operation. So, the math will likely pencil out for Uber drivers before it does for most car drivers (unless the experience of driving an EV is treated as an end itself, independent of the money it saves on gas an maintenance). At the time I posted that comment, by “credit”, I was referring to brownie points, not the actual tax credit. Unfortunately, there no good way to offer a $7500 credit to those who replace a gas car with no car, without it being abused. It would be too easy to claim the credit for selling a car, then immediately go buy another car. Or, it could be abused by switching from owning the car one drives to leasing it. There is also the legitimate argument that purchasing an electric car helps justify the business case for investing in electric car research, which could eventually push down prices, to the point where mainstream drivers start switching to EV’s – something that simply switching to no car doesn’t do. (Although, switching to no car does boost transit ridership, as well as pump money into car-based services that non-car-owners need, such as Uber/Lyft or Car2Go/ReachNow). All in all, while the EV tax credit as is, has its problems, I generally support it as long as its temporary, and goes away once EV adoption increases to the point where the credit isn’t necessary anymore. Which federal law already does by limiting the credit to the first 200,000 EV sales from each company. Like how streetlights switched to LED bulbs before they became widespread in homes. At the time the $10 per bulb was really putting off people, but with streetlights they said they could pay for themselves in a few years, both in energy savings and in not having to pay people to change them so often. We can still acknowledge the concept that the current system is unfair and think about how to improve it. It’s like free transit: we can recognize it as a good ideal and take our time figuring out how to implement it best. Maybe a cash credit to individuals is unfeasible, but a general investment in non-car amenities in the city or neighborhood would have an indirect benefit. That’s just off the top of my head; there may be better ways. But the point is to figure out how to get out of this trap of subsidizing the most inefficient and impactful transportation modes and housing designs the most. The US is like a case study of what not to do. Giving EV owners a credit to boost research into mass-produced EVs has some benefit, but in a lot of ways it’s missing the point. An electric SOV is still an SOV; it still takes a lot of space; especially on a population scale of 720,000 or 3.4 million. I drive a hybrid and understand your sentiment. BUT, do you really think that Lithium batteries are “clean” or “good for the environment”? Do you think that electric cars are really the solution to a perpetually-sustainable earth? Is there enough lithium for 8, 9, 10, 12 billion people to adopt electric cars as all nations on earth industrialize? And then continue such trend 1, 2, 3, X generations into the future? Is there enough material to build electric cars for people? And an even bigger question how are we going to dispose of millions of tons of battery waste? Maybe Trump will re-purpose the entire state of Nevada for all toxic waste, and not limit it to just plutonium. But hey at least we are decreasing air emissions. Oceans full of plastic, air full of emissions, and land full of toxic waste. At least the billionaires will be able to escape our failing planet in their rockets. So no more battery busses or streetcars for off-wire or tunnel running? You extract lithium from salty brine pumped into pools, the sun does most of the work. And yes, there is an essentially unlimited supply of it, since it isn’t consumed inside a battery. As automotive batteries need to be replaced, they’ll likely move to stationary applications (grid stabilization) where their degraded capacity isn’t an issue because you don’t have to haul them around. And after they’re too old for that? Reprocessing into new batteries. The environmental impact of batteries is pretty overblown, it’s fascinating to see so many people on a transit blog taken in by fracking propaganda. The mining is the biggest source of pollutants associated with batteries. Slag piles, Diesel powered excavators, Processing equipment. And it’s not just the battery. What about all the car parts? The plastic that goes into the panels of the vehicle? The steel for the frame? The rubbers for the tires. And on and on. Now multiply that by BILLIONS, and by GENERATIONS. Now, take a deep dark dive and think about the billions and billions of people in the developing world who are soon (within a generation) going to have the financial ability to live an “American” lifestyle which includes a car (electric car in the 2050s). The Earth just can’t sustain it. Even electric vehicles. But again, I applaud you for doing your part for right now. But the sustainable solution does not include even electric cars. It’s no cars. Or another planet. Or the end of our species. This argument is essentially that made by Paul Ehrlich and the Club of Rome in the 1970s. It’s still wrong! Population growth has peaked or is going into reverse throughout the world, except the places that are both very poor and very poorly governed. Those people by and large can’t afford cars. If cars and buses can be made to run on electricity, in principle, there’s no reason why mining equipment can’t also. We just need good enough battery technology and the will to make it happen. Southeasterner, Sadly, they won’t. Poor plutocrat descendants. Apparently the lack of gravity, perhaps combined with the much more radioactive environment in space, plays hob with the human digestive system. I guess the Star Cruisers will have to look like 1950’s space station designs but with lots of lead in the “tire”. That’s a lotta mass to accelerate to 1/3 luminal. And even harder, to slow down. The Washington Post ($) calls the tunnel the longest road tunnel in the contiguous 48 states, and the first double-decker. Uhhhh… the Treasure Island Tunnel in the middle of San Francisco Bay is a double-decker. It opened in 1936. They really need to come up with a way to pay reporters better to attract brighter ones. Change that to the Yerba Buena Island tunnel! Will we be able to come to the north portal from the north side, and avoid the shuttle altogether? If you mean can you start from the north portal and walk the tunnel south then yes. There are 4 entrance points. N. Portal, Battery Street tunnel, Seneca Street onramp, and the South portal. Stupid question alert: How are drivers going to get on and off the tunnel if the on and off ramps are closed for two weeks? See the updates in the post. Thanks for the question. Because the through roadway leads into the tunnel. The “off-ramps”, as the name implies, are for traffic exiting the freeway (which becomes from that point, a tollway). Seems to me that complaining about the tunnel advertising is like complaining about the cost of the U-Link launch party. For sake of argument, when people return to their cars (which they will), I’m sure you want them to use the new tunnel if they cross downtown because driving 2 minutes in the tunnel causes less pollution than 15 minutes through downtown, right? And if they want to go downtown, you want to let people that they shouldn’t use the tunnel because it doesn’t have downtown exits (which they may think because the viaduct had them). The WSDOT videos are good, but only a tiny portion of drivers actually look for those. Complaining about the cost of the tunnel opening party would be like complaining about the cost of the U-Link party. Complaining about the $4 million try-the-tunnel ad campaign is like complaining that Sound Transit is about to approve $10M for 5-7 years of advertising and marketing services. I can’t say whether that amount is warranted, but I hope marketing isn’t getting prioritized over fixing the vertical conveyances and other projects that directly improve the passenger experience. You’re right. I shouldn’t complain about WSDOT spending $4 million on advertising. That’s one of the few activities they do that doesn’t involve a large carbon footprint, and it uses up money that could have been spent on those activities with a large carbon footprint. That said, it seems like ST is spending money to gain market share from WSDOT, and vice versa. Which is to say, government is arm-wrestling with itself. Who drives by memory anymore? I can’t imagine getting in my car to head south thru downtown and not checking google, even just to look at the traffic. The ad campaign must have been dreamed up by those old people who insist on giving you turn by turn directions when you ask for an address. I have to give the marketing contractors a little credit. “Step Forward” doesn’t make much sense for a car tunnel, but it makes more sense than “Step Up” to an underground train station. Both firms seemed happy to make a cookie-cutter effort and gladly receive the money. I went to see the north portal, although I didn’t bother going in the tunnel. The slogan on the signs and spoken by the announcers was “Ride the tunnel”/ Referring to both general driving and the fact that the shuttle buses seemed to be running northbound in the tunnel, so you could walk through the tunnel to the south end and then take a shuttle bus back northbound “riding the tunnel”. Nobody told the participants that there would be no public transit buses in the tunnel when it opens, so nothing to ride. Metro has no tunnel buses in its 2025 plan. The 2040 plan has one route, a Fauntleroy-WSJ-SLU express.